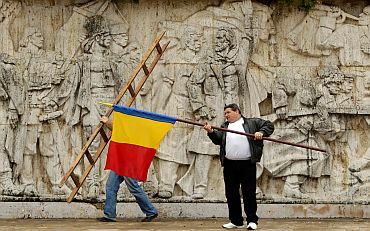 We present some of the most scintillating images from across the globe in the last 48 hours. Palm fronds frame the face of American actress Faye Dunaway portrayed on the giant canvas of the official poster of the 64th Cannes Film Festival on the facade of the Festival Palace in Cannes. The globally accepted film festival runs from May 11 to 22. 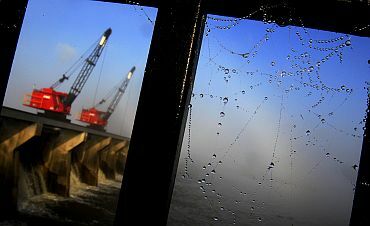 A view of machinery being used to open up bays along the Mississippi river to the Bonnet Carre spillway is seen through iron gates in Norco, Louisiana. The Mississippi river was approaching record flood levels and forcing area residents from their homes. Officials opened portions of the Bonnet Carre spillway near the refining hub of Norco, Louisiana, to send Mississippi river water to Lake Pontchartrain. 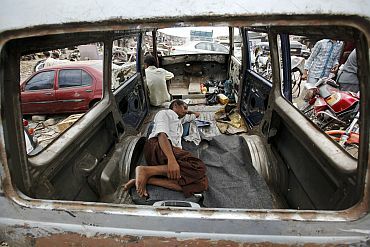 A labourer sleeps inside an old vehicle kept on a sale at a scrap yard in Mumbai. 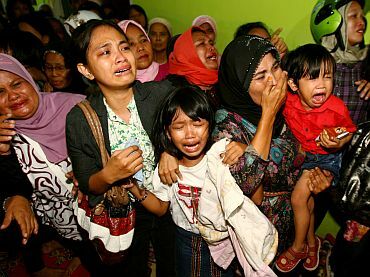 Relatives of Irwan, a victim of a passenger plane that crashed into the sea off Kaimana district, cries as his coffin arrives in Makassar in Indonesia's South Sulawesi province. According to local media, the Indonesian passenger plane carrying 27 people crashed on Saturday as it was about to land at the local airport in Kaimana. At least 15 people were killed. 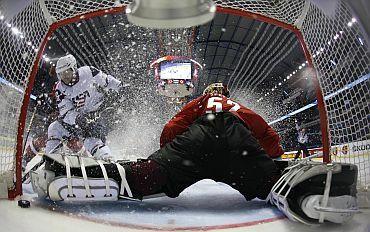 Switzerland's goaltender Tobias Stephan fails to save a puck by Ryan Shannon of the United States during a qualification round game at the Ice Hockey World Championships in Kosice, Slovakia. 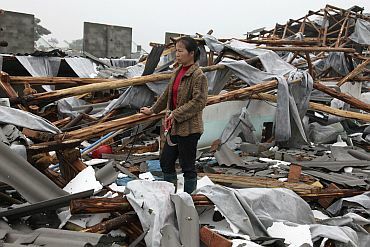 A woman stands amid the wreckage of her poultry farm, which was destroyed by a tornado, in Meishan, Sichuan province of China. A tornado hit the city Monday morning, leaving at least 20 people injured and some houses collapsed, Xinhua News Agency reported. 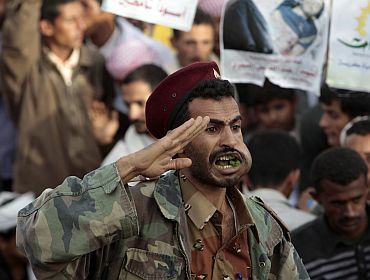 A Yemeni soldier chewing Qat salutes during an anti-government rally to demand the ouster of Yemen's President Ali Abdullah Saleh in Sanaa. 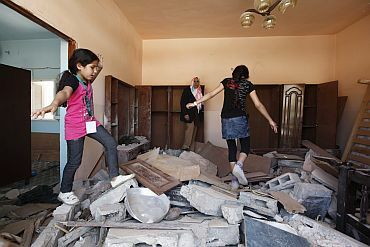 Yemeni forces fired at protesters blockading a government building on Monday, killing a shopkeeper and two protesters in a city that has seen some of the largest demonstrations against President Ali Abdullah, witnesses said. 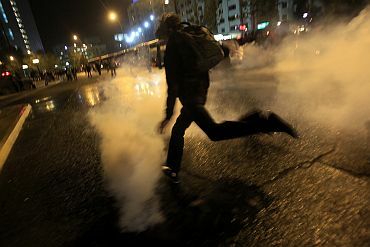 An environment supporter kicks a tear gas canister released by riot policemen during a rally after Chile's regional environmental commission approved a hydro-power dam project, in Santiag. Chilean environmental regulators on Monday gave the green light to the divisive $3.5 billion HidroAysen hydro-power dam project that promises to help ease energy squeezes, but opponents say it will ruin pristine Patagonian valleys. 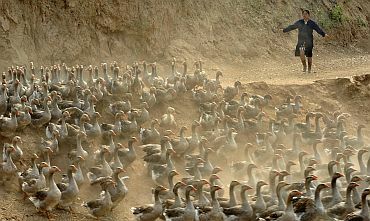 A woman drives wild geese to a pond at a farm in Linqi county, Shanxi province in China.